Oftentimes we find ourselves in the little predicaments of life wondering just “how” did we get there, with an even more puzzling question that follows, “how” on earth do we get out from underneath it. In that question and wondering, we find the problem itself, if we are only willing to take a long, hard look. The predicament may very well be of our own doing and the place we are looking for resolution is not high enough – we default to looking to an earthly answer, when we should seek an audience with the Creator. This Series presents a passage of Scripture that shows the direction, order and attitude which the Lord Jesus presented Himself as a model of how we should come to Him when we find ourselves in a place where we know we ought not be. The process is presented to us in John’s writings of the Gospel in John 11:29-45 (see Passage page for full text), very clearly giving us the way to identify how we fit into it today. There is only “question” asked – we should immediately recognize and understand the Lord ALREADY knows the answer, we are being asked for our benefit, not His. The question is followed by three powerful directives which are meant to show us as Christians that He has the Power to remove any obstacle, to pull us out of any place we find ourselves, and to place us back on the path He has established for each of us. For our Lord and Saviour, it really is that simple, but just as He did then, order is paramount and His timing is Perfect. (1) Where have ye laid him? – Jesus KNEW exactly where he was and He knows exactly where we are, but He chose to call out to those around Him so they would ponder the question. 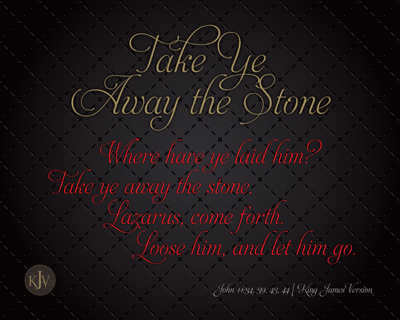 (2) Take ye away the stone. – Jesus KNEW what was separating Lazarus from all of them, just as He knows what we hold onto, unbelief and sin that we commit, which separate us from Him. We have to be willing to lay it on the altar, willing to forsake it and turn away from it. The Lord often uses others to show us that we have locked ourselves away and are used of the Master to unhinge the doorway. 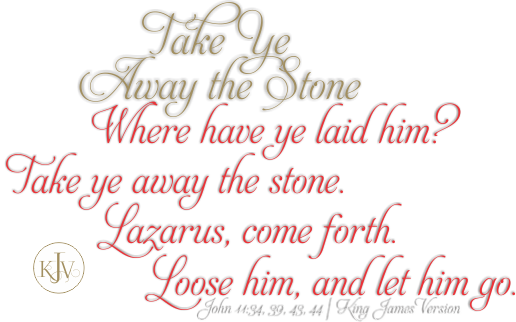 (3) Lazarus, come forth. – Jesus KNEW that Lazarus was the one that was in that “dead” place, He knows our name and wants us to hear His Voice when He calls to us – no matter where we are or have found ourselves. It is a Directive that He gives, but we are the ones who choose to listen for and to His Voice, none other can answer for us, just we ourselves. (4) Loose him, and let him go. – Jesus KNEW what he was bound up inside of, commanding that Lazarus be freed from that bond, not to be held in that grip anymore – just as His desire is to set us FREE of those chains that can so easily bind us. We may often find ourselves believing that we are still attached to past chains, not realizing that when the Lord frees us, we are to remain FREE of them. Part of that process is having others give us godly wise counsel and be accountability partners during and well past the crisis being worked through. Oh, how much the more that I want to make sure that the stones NEVER get rolled into place, where my lifeline to the Father and Throne Room of Heaven get cut off from me. I also know that when they do, He wants me back in His Will, that He WILL get my attention, He WILL make me aware of my position, He WILL call me by my name so there is no doubt as to who He is calling AND that He WILL loose me from those things which bind me, providing me the helps, counsels and escapes where it is no longer my struggle by my depending on Him. There are twelve (12) prints that present passages of Scripture that allow each of us to see why “removing the stone” is SO important, which are individually packaged for our understanding from God’s Holy Word. We have to be willing to not hide behind the stone, relying on and in ourselves only, thinking no one knows where we are. The number one item drawn from this Series is to recognize that even when we have a “stone” between us and our Heavenly Father, the Creator God, He is still willing to see our need. As His children, He desires us to stay in Fellowship with Him, but of course with our sin nature – we are prone to wander. We should be ever thankful that we have in our own hands His Holy Word that shows us a human side of our Lord, to demonstrate His understanding to us how He ultimately has the Power to Forgive and Understanding of our disbelief’s. God’s Word gives us an incredible display of His Love, Forgiveness, Salvation, Mercy, Grace – that we should have NO doubt that He will go to ANY length to have Fellowship with His Children. What would you do for your child? How far would you as a parent be willing to go to get to your children? When would you be willing to sacrifice ALL? The God of All Creation gave His ONLY Begotten Son, Jesus Christ, for EVERY child, even those that think they cannot be found… He KNOWS exactly where you are, who you are, what struggles you are facing, and has the Power to Forgive, Heal, Save and Loose you. Is there someone that is struggling, who is watching you to see if you notice their stone, Christian? Our testimony being shared with others as a witness may help another person consider that our God can remove their stone too. Copyright © 2015 Take Ye Away the Stone. All Rights Reserved.